The significance of nursing perspectives has gained renewed interest as social pressures to reform healthcare have created challenges for care that is more effective, more effective and more economically sound. In both theory and in practice, nursing offers possibilities that address each of these goals. We are inviting articles that address the state of the art of nursing theory as we approach the third decade of the 21st century, revealing important contributions that nursing brings to create needed change. 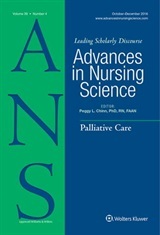 We welcome articles addressing the full range of theoretic development: articles that report empiric research structured from existing nursing theories, philosophic analyses related to theory and knowledge of the discipline, critiques of existing theoretical approaches, and descriptions of new and evolving nursing theories. Manuscripts are due by: July 15, 2019, but are welcomed any time!